Summer 2008 is fleeting fast. It seems like an eternity since my wonderful time in Paraty, Brasil in the southeast of Rio de Janeiro last month. There I visited the Saco do Mamangua, clearly one of the most beautiful places that I have been in 50+ years….. So what if I capsized my canoe in the mangrove, all my valuables were safely in another canoe with paddlers with skills. 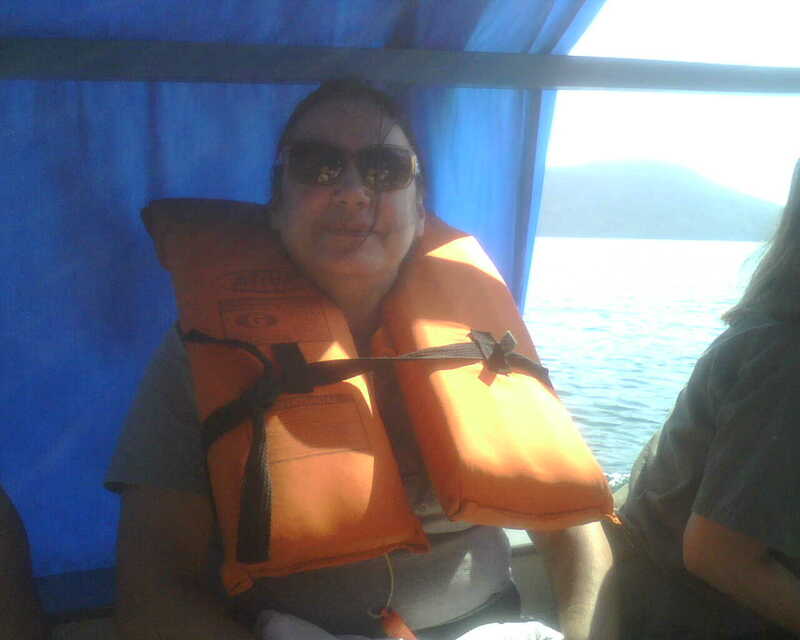 All I had to do was not move (or breathe) and I made it safely to shore in Paraty Mirim. Will never forget the hospitality of Dona Gracinha, the little barquinhos made of caxeta wood that I brought home with me, and the utter beauty of the Atlantic rainforest where beautiful orchids with their roots extending in the air were attached to the trees. I saw pioneer vegetation growing timidly on land being reforested. On the way to the rain forest with biologist, Paulo Nogara. I hope to be able to find the book by Paulo Nogara, our biologist in residence from the tour, who paddled our canoe like a gondolier. His love for this country was so evident. He was an excellent teacher who raised our awareness of both the beauty and the fragility of our surroundings. In retrospect, it was a great exercise in self-control to surrender to the movement of the boat. I finally “got it” Type A as I am. Mentally, I can still go back to the peace of the setting sun in the beautiful sunset of Paraty Mirim. P.S. The little painted caicara boat that I brought home from that day is sitting on my dining room table today. It helps me go back there in my mind. 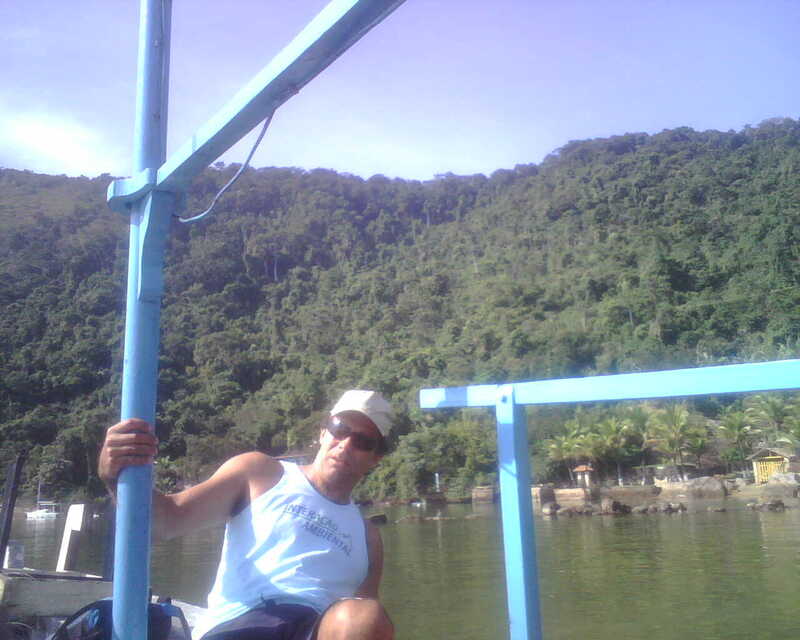 When I think about the locomotion involved in it all- bus, boat, hike, canoe and the plane ride home, the barquinho gave me a real workout then and now a lot of peace. I began it at Carnegie Mellon University for a workshop sponsored by the Open Learning Initiative. I got to know their French Online course up close and in person. It was a fabulous f2f experience and I am thrilled about the prospect of continuing to connect with my new colleagues there. It shows the longevity and proves the utter logic of OER that after all these years of OCW and OLI, we are building a network that aims at providing more access. Even more important to me as an individual practitioner, this work provides us a forum in which we can discuss what really constitutes quality in online teaching and learning. I really need to have these conversations. To have them with language educators was real ‘icing on the cake”. One interesting point that came up here regarding instructional design of online courses was the study on the expert blind spot. (Nathan and Petrosino 2003 . Preconceived notions on how concepts should be presented can cause a disconnect between teaching goals and learning outcomes. five days later, I keep hearing the message “You do not think like your students and they do not think like you”. When we build and teach our online courses, we need to keep this difference in thinking in mind. So far, I really enjoyed a presentation by Howard Rheingold, whose work I have followed since his book The Virtual Community years back. He now has a very interesting course going on at UC Berkeley called Visual Communications/Social Media. His class as explained on his online syllabus is super participatory with subheadings like “Participation mandatory”, “Leadership required”. He has students interacting in ways that immerse them in collaborative tasks while using all the new tools,blogs, wikis, etc.. . Anyway, he was a keynoter at e/merge and his talk was followed by a robust discussion by educators around the world. This virtual conference is employing every kind of new technology to connect participants. As much as I love to visit places physically, it is wonderful to be able to experience so much collective expertise without leaving home. This is particularly true since air travel has recently become so difficult, grueling and painfully inconvenient. (Hear my anguish??) I see no reason why we can and should not greatly augment the online component of all major conferences, partly as an access/inclusion issue for people who cannot attend f2f , as well as for many other very good reasons. Sitting in the Amsterdam airport, a remarkable place in that it contains a Van Gogh museum and a casino in addition to all the shops and things you’d come to expect. But best for me is that I have this wi-fi connection . I’m sitting outside this area called “the communication zone” and it’s a joy to be able to communicate. So y’all keep that in mind when you need to connect somewhere. I wish we could get out and actually SEE Amsterdam, but that’ll be another day. Rick and I are on our way to Ghana for the first Pan-African forum on Open Educational Resources. With my colleagues from the MERLOT African Network, Dr. Moustapha Diack, Dr. Gerry Hanley, who is also the Executive Director of MERLOT, and Dr. Solomon Negash, we are all going to give a MERLOT workshop for educators from all over Africa and the world. Hard to put into words what a great thing this is. OERS are really taking off and it’s about time to acknowledge the hard work folks have been doing to increase access to technology-enhanced learning materials.Look at all these portals on Wiki Educator . The bottom line is they are all making very good materials available for free. Why? Cause it is the right thing to do. Over the next several days, I hope to be blogging the conference from Ghana. Please check back here for updates. I expect this trip will be a wonderful adventure. A highlight was when high school and middle school students came on the stage to interact with Prensky about what they liked about studying a language and what they really did not like. The dream situation for them was to be able to go to a place where the TL was being spoken and to be able to communicate and get what they want. Technology enables real-world communication and so does speaking the language. Students realize that both skills are part of the equation. The less interesting part from the learner perspective was the classroom drilling with one student using the analogy of a nail/lesson being hammered into his head. The students reported that they enjoyed being asked how they’d like to have their school work designed. They liked the opportunity to be creative and they liked it when language learning led to real-world communication They said that they wanted to learn the language that would help them negotiate practical needs when traveling. The onstage interview was followed by an exchange between the students and the teachers in the audience.Teachers came up to microphones in the crowded ballroom to bridge the gap between digital immigrants, those of us who predate computers and the digital natives on stage. It was an invigorating experience to hear the conversation about re-imagining how we all work in a digital world. In Prensky’s world, we are all learners with the power to transform the educational experience for all. It is a place where everyone is learning, creating , sharing and collaborating. I had a few ironic experiences today. First, my daughter was watching the 6th season of the Sopranos on netflicks, the episode where Carmela is walking around Paris taking in le Louvre, les ponts, les belles statues, etc. and were it not for the occasional F-word I could almost teach a very communicative French lesson based on her wonderment and surprise. And of course, I had to think about the discussions that could emerge from contrasting the Paris she experienced in her privileged condition with the everyday life of city dwellers of lesser economic means. Mais non, mais non, voilà qu’on nous gronde ! Qui vous démembrera, c’est son affaire ! I just marvel at how a totally coincidental TV experience happened moments before I fell upon this incredibly evocative song. It’s like my mind was meant to go here today. I cannot wait to hear the rest of the cd. Bee rocks the house NOLA style. It was a special morning in New Orleans on Friday when Bee invited the Webheads in Action to the MERLOT 2007 conference via Alado and Second Life. They checked in from Australia, New Zealand, Portugal and Taiwan etc. etc.. Bee was really effective in showing how small the world can be when educators with a passion for sharing get together. No more working in isolation. The potential for exciting collaborations between teachers and students worldwide is already there. Hear/see the keynote at Alado and see Bee’s spectacular NOLA pics at flickr tagged merlot2007onlap. It was really a week to remember. Our community workday at an historic elementary in Mid-City was a phenomenal start. Forty-two MERLOT folks taping and painting trim in an elementary school that saw five feet of water in its ground floor level after Katrina. They lost everything inside either because of the water or the mold after the water receded. Our work was a small contribution in light of the need, but it did wonders for all of us. The school is going to be better than it was before Katrina given the hard work of the many volunteers who are working there. Troy, the volunteer coordinator told us that this was one of nine schools he was readying for a Fall start. Everybody wanted to do as much as he/she could. MERLOT had a new feature called Learning Circles this year and they were very well received by the attendees. MERLOT World Languages sponsored one called The Many Languages of MERLOT where attendees from Brazil, Israel, Japan, Senegal, Canada, Italy, Chile, Spain, the US and the UK and other lands all spoke volumes about how MERLOT could evolve into a more multilingual resource. The discussion moved from the political “Do we translate?”, to”What do we translate?” and then to a more technical, but extremely stimulating conversation about metadata. Mous Diack, from Southern University and A&M College and director of the MERLOT African Network project, rightly identified language as a real access issue. Susanna Dammann, project manager of Linguanet Europa (MERLOT’s 2007 Editor’s Choice award winner) and her Linguanet colleagues, Jose Ignacio and Luis, from the Instituto Cervantes and the Universidad Politecnica de Madrid gave MERLOT many good ideas on possible directions in which to proceed. This meeting was one of the more profitable new features at the MIC because it brought home the growing international contingent in many different disciplines. The community-building was great as participants talked and MERLOT listened. Back in the French quarter, we took in the wonderful Rue Royale at night. Art, jewlery, antiques, everything glowed in the light of the gaslight lamps. The jellyfish lamps were among my favorites. Diane showed us some great art, including a few original Rodrigues at K-Pauls. Will we ever forget the Duck and Shrimp Vindaloo? The Creole Mary’s?